Continuing on with my theme “Battle of the Graphic Biographies” begun earlier this year Che Guevera, this month I’ve had a couple different titles at Hill & Wang take each other on– all a part of their Novel Graphics series. I, somewhat arbitrarily, began reading these books in chronological order: Trotsky, J. Edgar Hoover, Malcolm X, Reagan. My interest is obviously to provide some aesthetic feedback, but more to point out political strengths and weaknesses of the titles. I had serious suspicions about this one, going in. 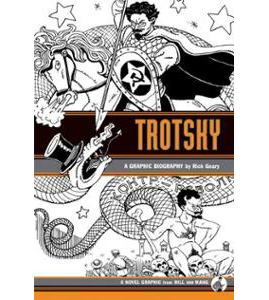 Whereas the other book covers are more or less realistic, Trotsky’s is purely mythological. We see him astride a horse as some kind of atheist St. George–all the while he sits underneath, naked on a pile of human skulls. These images come from two very different interpretations of Trotsky’s role in the Russian Revolution–both over-zealous and emotional, both incorrect. 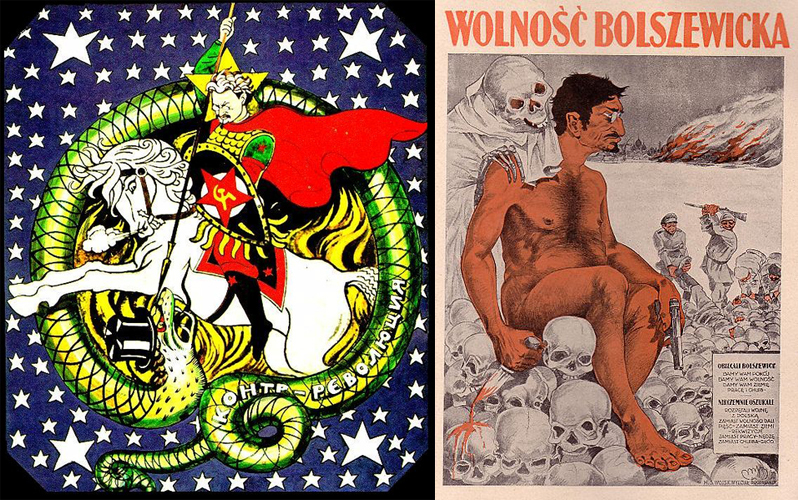 While I appreciate the re-visiting of historical cartoons and illustrations, it seems necessary for me to make note of the the point that both graphics were commissioned by opposing governments during one of the most highly polarized moments of the 20th Century: the rise of the Russian Revolution. I think anyone who sees a book of 100 pages claiming to tell the life of Leon Trotsky is pretty much kidding themselves. Once into the story, you might be able to tell why: this man was a mover and shaker of continents, social structures and financial systems in a way that practically boggles the mind. In a time before television, let alone the internet and social media, Trotsky was world-famous for his ideas and his conviction to carry them to fruition. This book, albeit abridging-ly, details his early years as a landowner’s son in modern-day Ukraine, a student activist and intellectual, his political development, his multiple exiles by the Russian Czar. It’s a whirlwind. In fact, it’s a struggle just to get all of these points down, without even going into what made Trotsky’s ideas so intriguing/dangerous, let alone his various roles in the the Revolution. Despite the obvious limitations, I believe Rick Geary does a stand-up job trying to pull together an epic biography that at least attempts to discuss serious politics. Geary’s style lends itself well to the time period: a bit cold and minimalistic–but not cartoony. The line-work reminds me of borsch and cold, dry winters. In a good way. I can’t really blame this book for what it isn’t–it’s not an in-depth biography of the Russian Revolutionary, in any sense. It’s not a clear history of the Russian Revolution either. But it will give you a crash course that may peak your interest, and lead you to other works about one of the most interesting men of modern times. Like Trotsky, Malcolm X is one of those four-letter words of the 20th Century. People alternately love and cherish or hate and fear everything that the man stood for. It really is a testament to the power of their ideas and the charisma with which they disseminated them. Malcolm’s story has been told in epic fashion many times: there is the Autobiography of Malcolm X, as told to Alex Haley. Spike Lee’s “X” with Denzel Washington was an immediate classic. Once these essential biographies have been consumed, you believe that you know the man’s story. 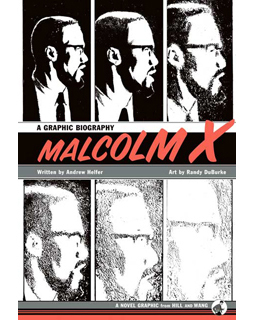 However this graphic biography, in fact, delivers additional information that even someone familiar with Malcolm’s story will find new and enlightening. Scenes I found most interesting included the details of his time as a hustler on the East Coast–as well as his final days in conversation with Nation of Island leader, Elijah Mohammed, whose candid remarks about women are better displayed here than anywhere else that I’ve read. Malcolm’s entire life is characterized by a seemingly endless sense of change and evolution. In the end, the man who seemed tireless in his conviction, his self-confidence, was also likely his harshest critic. He went from being a pimp and a hustler to a raging animal in prison, a Nation of Islam preacher and black segregationist to working with whites when and where he could. And where we led, people followed. Because of his constant evolution, it is difficult for critics to demonize him. His radicalism has also made it pretty much impossible to water down his message–as has been done with Martin Luther King. Of all the illustrators of this graphic biography series, I am in love with Randy DuBurke’s style. It is by far my favorite. He illustrates an emotion with what seems be a shadow-heavy photographic realism. Stylized but not cartoony, I even see some graffiti-stylized splatters in the background, that give it an additional grittiness. Given that author and illustrator are two different people in this work, I find their respective trades synching incredibly well. 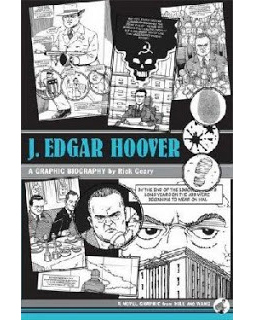 Rick Geary is back after Trotsky with this graphic biography of FBI chief J. Edgar Hoover. Actually, this book was produced before the Trotsky one, but I’m going in some other kind of chronological order. Unlike Trotsky and Malcolm X, I had never read a biography of Hoover before, although I was familiar with his role in Communist witch-hunting post-WWII, as well as his hand in the FBI’s notorious COINTELPRO counter-intelligence programs. What hadn’t occurred to me was the length of his office. 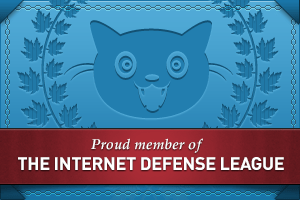 The man was active in government from Emma Goldman… to Ronald Reagan. Think about that. Through half a dozen presidents. He was arguably the country’s most powerful civil servant. His ability to avoid partisan politics and harness the power of government bureaucracy, ironically, reminds me very much of his arch-nemesis Joseph Stalin. These two men dominated their countries with iron fists, using many of the same tactics, for much the same period of time. The key to both of their success was securing and mastering the administrative machinations of their positions. While I see Rick Geary showing the light and dark of Hoover in this biography, he is at worst portrayed as a bit of a maniac who dabbled in unconstitutional activities for the protection of his dear country–and the all-sacred “American way of life”. We see the mass deportations of immigrant unionists, communists and radicals more as the shuffling of ants from one place to another outside the country–not the same brutal inhumanity with which Trotsky is depicted, sitting on a pile of bones. Do I wish the comic would take a little more interest in how J. Edgar Hoover was a detriment to the country? The historical precedents of jailing and deporting descent, spying and wire-tapping, infiltration into progressive groups? Yes, in fact I can’t really think of any other singular man who probably committed more damage to democratic movements of the 20th Century than J. Edgar Hoover. But that’s my opinion on the matter–and Geary makes little to no effort to hide the evidence that would lead someone to those conclusions. He includes his very trouble remarks on communists, unions, student activists, black people–alongside the sea of other people that rubbed him the wrong way. Of all of the graphic biographies, Ronald Reagan’s seems the most surreal. This is very much a theme of the book itself. Where was the threshold between Reagan the man and Reagan the actor? Reagan the actor and Reagan the politician? The book very much lends itself to the theory that there were no clear lines, even to Reagan himself. Acting was a part of him from a very young age, as were many of his political and moral influences. 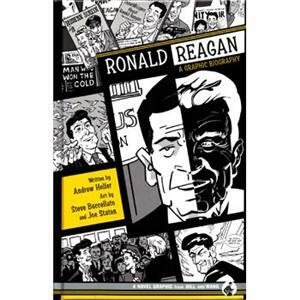 Also more than any other comic in the series, this book relies very much on Reagan’s own interpretation of himself and his life–including instances like his student strike in university, which isn’t documented by the school–or his record 77 rescues as a lifeguard, even though there were many instances in those rescues where, hilariously, people apparently didn’t need to be rescued (THAT comic history vignette, I would love to see). More than many other American leaders, Reagan very much controlled what media and the public thought of him. That was his gift as an actor. While there is some mention of his early days as an FBI informant, as a ‘friendly’ testifier in the mid-century Inquisition of American leftists and progressives, as well as his later involvement in the dismantling of unions, tax cuts for the rich, military intervention in Grenada… the underpinning theme Geary really seems to be driving home is Reagan’s mastery of the spectacle. It wasn’t really anything he did–and he did many things in his life–it was how he won support, how he charged through his competition and adversaries at the crucial moment. It wasn’t what he did so much as how slickly he was able to get away with it. I find the artistic style of this work, shared by Buccelleto and Staton, to be my least favorite of the series. Faces and gestures are bubbly, cartoony, very “Leave It to Beaver”-ish, which works for Reagan but not for me. I feel like anyone who watched television during the last century knows this perspective of Ronald Reagan. So despite my distaste I understand perhaps why they went with it. Maybe, for all that time behind the camera, there really was no other way to see the man. He seemed to understand, at an early age, that public image is its own form of immortality. Of all the comics that I read, I enjoyed Malcolm X and J Edgar Hoover the most. Both had wonderful artwork and kept me intrigued with information that was new to me. However I appreciate the set as a whole for its fascinating takes on 4 totally different individuals. I have found much more intricacy in all of the books’ designs than I initially thought would be there.